Has anyone done this? I think it would be pretty easy, and a fun project! Any advice? 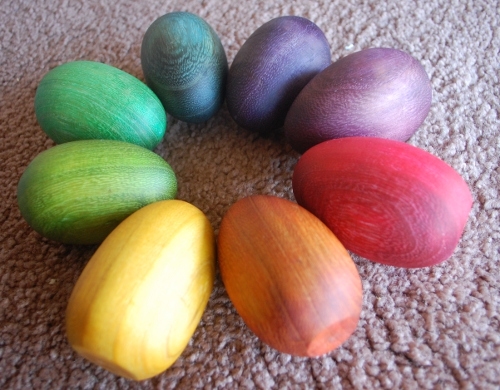 Some of the tutorials I found use food dye, some use Easter egg dye. I wonder what will produce the best colors? I haven't done this or heard about it but am definitely interested in what you find out and if you do this. Any idea where to get the wooden eggs at? I will say that we used food coloring on Friday with snow and to do that baking soda vinegar science project and it was a mess and a half! It took A LOT of washing to get the color off. I've seen the eggs at craft stores, like Hobby Lobby or Michael's. I think I'll follow this tutorial. And here is another tutorial on how to seal them, so the dye doesn't rub off. I'm not sure if I'll take it that far, though. Curious to know how this turned out? I didn't end up doing it. Maybe this year!